Cape Breton Tourism Spotlight: Baddeck Lobster Suppers Restaurant hosts Lobster for Luv Haiti Benefit Dinner Tonight, September 17th. Hope to see you there. Baddeck Lobster Suppers Restaurant hosts Lobster for Luv Haiti Benefit Dinner Tonight, September 17th. Hope to see you there. 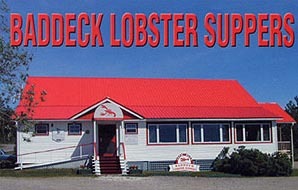 The Baddeck Lobster Supper Restaurant continues to get rave reviews from visitors travelling around the Cabot Trail. If travelling around the Trail make sure to stop in Baddeck and check out the excellent choices on their menu. Restaurant hours and menu listed below. Please email us with large group functions or special requests!